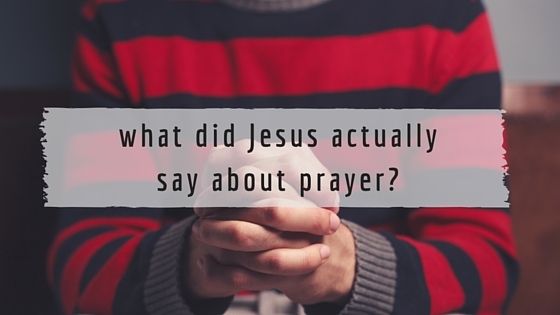 What Did Jesus Actually Say About Prayer? I heard an expression that “There are no atheists in foxholes”—meaning that when people are in trouble they call out to God… no matter who they are. I don’t know if that’s true. But I’d guess that “Dear God, please help” is most uttered phrase around the globe. Prayers speak louder than words. They are the launching pad to a renewed, ascending, and outward-looking life. So how can we NOT pray? Prayer came up a lot. So I thought I’d zero in a bit. “And when you stand praying, if you hold anything against anyone, forgive them, so that your Father in heaven may forgive you your sins.” (Mark 11:25). “pray for those who mistreat you” (Luke 6:28). “And I will do whatever you ask in my name, so that the Father may be glorified in the Son. You may ask me for anything in my name, and I will do it.” (John 14:13-14). “I chose you and appointed you so that you might go and bear fruit—fruit that will last—and so that whatever you ask in my name the Father will give you.” (John 15:16). Speaking to his disciples Jesus says: “Until now you have not asked for anything in my name. Ask and you will receive, and your joy will be complete.” (John 16:24). Jesus prays for his disciples (John 17:9): that they are protected; that they are united (i.e. “that they may be one”, John 17:11); that they may have the “full measure of my joy within them” (John 17:13); and that they are made holy “by the truth” (John 17:17). He also prays for all “who will believe in me” through the disciples’ message, “that all of them may be one”; and that people will believe that the Father is the one who sent Jesus (John 17:20-21). Jesus warns against using the temple as a “den of robbers” and that it should be a “house of prayer” (Matthew 21:13). He tells the disciples to pray so that they “will not fall into temptation” (Matthew 26:41). Before his crucifixion he asks his Father if it’s possible for the cup (task) before him be taken away, but ends up praying for “your will be done” (Matthew 26:42), meaning God’s will is paramount. Jesus often goes off to pray by himself (sometimes through the night), and this gives him focus and strength for a special task before him (see, for example, Mark 1:35-39). Plus, some exorcism can only be successful through prayer (see Mark 9:25-29). You pray because it’s how you talk to God. You pray because Jesus teaches you how. You pray because God’s plan for you is better for you than your plan for you. You pray using the pattern of the Lord’s Prayer (which outlines God’s agenda for the world and your life). You pray, as a habit, alone. You pray sincerely and directly. You pray for your enemies. You pray confident for an answer. You pray for forgiveness after you have already asked for the forgiveness of others. You pray to not fall into temptation. You pray for focus and strength for God’s tasks before you. You pray in Jesus’ name. You pray for God’s will. Imagine your life if you prayed like that! And you should be buoyed by the fact that Jesus is praying for his followers, that we would be united, and that we would be filled with his joy. So often we treat prayer like a last resort. A wise friend told me something he had overheard: “The task is to become child-like without becoming child-ish.” Genius. Becoming child-like is not about being naive. A child lives in the now, is able to accept a gift, delights in wonder, is obviously imperfect, and is totally dependent on another to survive. Turns out humans do have wings—they’re called knees. But don’t take it from me–I’m just a guy with blue shoes. Take it from Jesus. A great post about Prayer. At times, i feel like it was just a ritual i follow but not truly understanding. Thank you for posting. Prayer is a most effective way to talk to God who is always ready to hears us. God is Love and mercy. A stands for Amen. Great msg Matthew, I like the red letter compilation and the summary all being found in one place… Wonderful review bookmarked for future reminders. Hi Guy, thanks for the note and I’m glad that you liked the blog and found it helpful!